Joie de vivre awaits at Chuiba Bay Lodge, a premium holiday destination for the discerning guest. This speciality lodging in Chuiba is elegantly poised on the northeastern shores of the Mozambique coastline, just a few kilometres outside Pemba town. Esteemed as one of the best accommodations in Pemba as demonstrated by the reviews and traveller comments on TripAdvisor, Chuiba Bay Lodge is a sublime beach holiday resort for Mozambique honeymoons. This stunning lodge perfectly combines its sublime location, world-class service and modern day comforts to provide a wonderful escape where unforgettable memories are made. The lodge has 6 well-appointed chalets that are kitted to a tee with all the creature comforts you would find in a 5-star hotel. Conveniences include satellite TVs, ceiling fans, personal bars, air conditioning, Wi-Fi and safes. Each chalet features a spacious lounge with large patio doors that open out onto the beautiful surrounds. There is also an elegant en-suite bathroom complete with double basins, toilet and a deep bath. Large verandas with cushy day beds, a gym, spa plus 2 swimming pools all add to the allure of this exquisite lodge. All of the Tripadvisor hotel reviews and guest feedback on Chuiba Bay Lodge are positive with some calling it ‘a piece of heaven!’ and others, ‘amazing!’ We share the same sentiments with those who have stayed at this lodge. 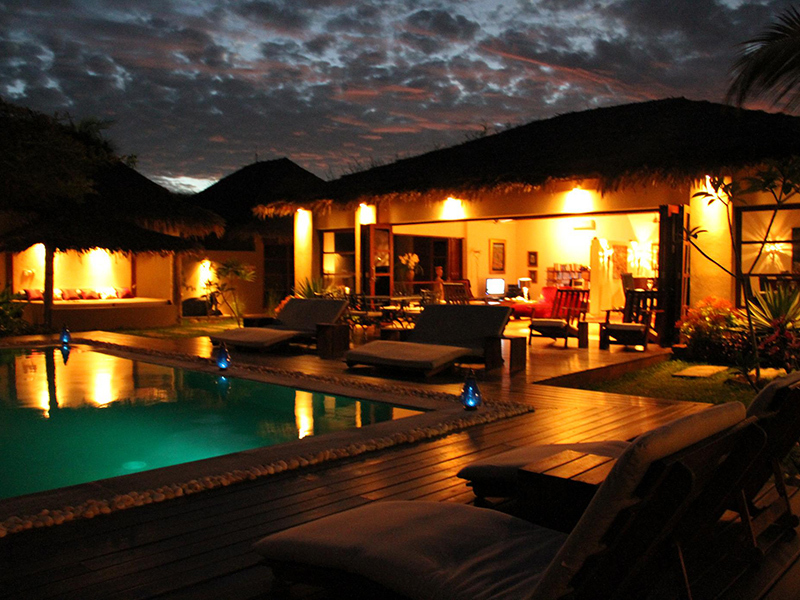 We like this top Mozambique beach property for its location on a quiet stretch of beach and its glorious food which is prepared using fresh ingredients. The laid back ambience of the place is great and we highly recommend this lodge as an excellent base from which to explore the area and enjoy its many exploits.